Leading into these European Championships I was very happy with my shape. Having evaluated past races and identified areas that were letting me down. Training had been tough but tough in these areas that were preventing me from a big result. Swim-Bike brick sessions and hard bike intervals were the focus while the rest remained consistent. Running sessions were possibly the quickest sessions I have ever completed. So there was no denying I was confident I could race well. Early season goals were set as a top 8 Europeans finish. The goal going into this race was still the same but deep down I believed if it was to be my day then a medal was possible. Pontevedra, Spain was the host of this year’s Championships. Being the home city of reigning world Champion Javier Gomez crowds on race day were spectacular. This generated a great atmosphere and the vibe around the race site was simply awesome. Racing with start number 4 allowed me a good start position on the pontoon. 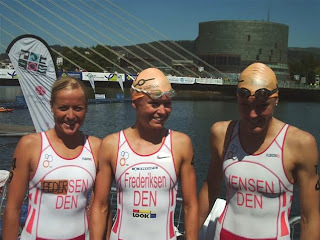 I had a solid swim, not exactly a lonely one as for the entire 1st lap I was in the ‘washing machine’. The 2nd lap however I was able to gain positions and exited the water 11th. Holding my position through T1 I instantly felt good on the bike (something that up until now has been non-existent). 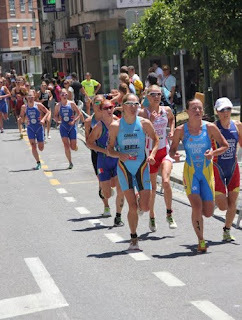 With 4 girls managing to gain 30+ seconds on the main pack of 35+ athletes after T1 the pace was ‘on’. The main pack did not hang around. A number of strong cyclists including Danish teammate Camilla Pedersen rode very strong at the front. Quickly this lead evaporated and by the time we got onto the 3rd lap of 8 we were one big lead group of 39+ athletes. The race it seemed was playing into the hands of the quick runners in the field. This was giving me confidence. I rode smart, stayed out of trouble and focused on hitting that run as fresh as possible. Temperatures were recorded at high 30’s and rising this is something that before the race I had hoped for. Was this to be my day? Dismounting the bike I believed I could run for a medal. Instantly Emmie Charayron (FRA) established herself as the leader accelerating away from the field. Behind a medal group was forming this group included myself, Frintova (CZE), Mazetti (ITA), Murua (SPA), Stimpson (GBR), Yelistratova (UKR). 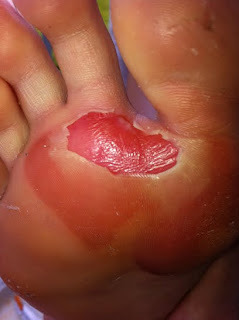 The heat was immense but I tried not to think about it instead I was forced to think about the growing pain that was coming from my feet (forefoot area), what was this? Is it just the heat? For 1.5 km I was ‘comfortable’ from 2 km I was ‘uncomfortable’. Suddenly the pain in my forefoot region on both feet was severe. I no longer landed on my forefoot and as the run progressed this only got worse. Why now? After the 1st of 4 laps I lost contact with this medal group. My cardiovascular system was under no real pressure. The pace in the pack did not pressure me but now the pack was simply pulling away!! I was still lying in a very good position and had to just grit me teeth (lots of them) and keeping pushing. As the km’s passed the pain level increased and my position slipped. From being a medal contender I was slipping ever closer to being the wrong side of top 10. Now as the pain started to affect other areas of my body it was then simply crying out for me to stop. I become nauseous, suffered with severe headache and lost all control of my bladder (Really not nice and very ladylike, apologises to all those spectators who witnessed it L ). With 1.5 km remaining I was sitting in 10th position so close to my goal of top 8. I sucked up the pain and pushed as hard as I could and then collapsed across the line in 9th position only 2 seconds from 8th. Immediately after the race I was gutted to have finished in 9th position knowing I put myself in contention of a medal. My feet really were in a bad way. What caused it? Why were they so painful? It is not uncommon for my feet to get blisters, which is why I always tape them before every race. This race however the tape came off during warm up and god only knows why I did not re-tape them = ERROR. The tarmac, which led us from swim exit to transition and also greeted us when we dismounted the bike, was incredibly hot, so hot that I think it has caused my feet to blister as a result of minor burns. So as I mentioned at the beginning had I written this blog within 24 hours of the race I would have been very negative. There is no denying I wanted a medal and did not get it = NEGATIVE. Now having had time to reflect I can honestly say I am satisfied with my 9th place finish. Firstly 9th is a solid finish position = POSITIVE. Up until 2 km I did everything I needed to and put myself in contention. The areas I had worked so hard on had paid off; I had a great waters exit = POSITIVE, strong run to transition = POSITIVE and was instantly able to push power once onto the bike = POSITIVE. These are all areas that have let me down in the past. Not this time. I again was able to gain a large amount of Olympic points pushing me ever closer to that Olympic spot = POSITIVE. Other than the extreme blisters I have no major injuries = POSITIVE. As you will probably notice the areas that have let me down are all minor issues. This is why now I am able to look back and be satisfied with my performance, progress is still being made. Olympic points are still being collected so I would be a fool if I were not satisfied. Thanks to those extreme blisters on my forefoot they have now received an entire regeneration of skin. Making them look 30 years younger J and I am back running after only 3 days off. I am now very focused on my next race that is Edmonton ITU World Cup, Canada on 10th July. Thank you for your continued support follow me day to day via Twitter and Facebook.